Wall Street retreated on Oct.21 after forecasts from DuPont, Sun Microsystems and Texas Instruments raised fears that companies' outlooks for the fourth quarter and beyond could indeed signal a severe economic downturn. After logging sharp gains the previous session, the Dow Jones industrial average fell 2.5 percent, while the Nasdaq composite index lost more than 4 percent following a weak showing by technology names. Some pullback was to be expected after the Dow shot up 413 points on Monday. But investors poring over a mix of companies' third-quarter reports found enough unsettling outlooks to set off heavy selling. Still, analysts said investor anxiety appears to have lessened considerably compared with the previous two weeks when fears about a dearth of available credit and the health of the economy battered stocks across the globe. Strains in the credit markets eased further in response to a sweeping series of bailout measures by world governments, including a joint U.S. and European plan to buy stakes in private banks to boost to their lending. Demand for Treasury bills, regarded as the safest assets around, remained improved from last week in a sign that credit markets are gradually returning to a healthy state. But analysts have warned that the market will see a stretch of volatile sessions as Wall Street recovers from this month's huge drop. Although investors have been expecting third-quarter earnings, and even fourth-quarter forecasts, to reflect the damage from the financial system's problems, the reality of companies' reports have been unnerving. "It's just this back-and-filling stuff. It's driven by earnings, yes, but also emotion," said Harry Clark, chief executive of Clark Capital Management. "It's going to be this tug-of-war for a couple weeks at least." The technology-focused Nasdaq saw steeper declines than the other major indexes after server and software company Sun Microsystems warned it would post a loss for its fiscal first quarter and book a write-down. Texas Instruments shares fell to their lowest level in more than five years after the chip maker turned in disappointing earnings and issued a lackluster forecast amid slowing orders. Broader indexes also declined. The Standard & Poor's 500 index fell 30.35, or 3.08 percent, to 955.05. The Nasdaq composite index shed 73.35, or 4.14 percent, to 1,696.68. Declining issues outpaced advancers by about 2 to 1 on the New York Stock Exchange, where consolidated volume to 5.09 billion shares compared with 5.1 billion shares traded Monday. Volume, which surpassed 10 billion at the height of the market's volatility, has retreated to more normal levels. Kim Caughey, equity research analyst at Fort Pitt Capital Group, said the absence of steep late-session selloffs in the past few days and the lighter trading volumes are signs that some order is returning to the market. At its worst during the past month, investors simply sold whatever they could and the crush of those cashing out weighed on the market. Much of that selling came in the final hour of trading, creating wild swings and massive pullbacks. "There were a huge amount of redemptions both on the hedge fund side and the mutual fund side that were driving that in the darkest of days," she said, noting that investors now have more time to evaluate stocks on merit. "It's a more or less a normal reaction to company-specific news." On Monday, markets spiked on more signs of a reviving credit market and support from Federal Reserve Chairman Ben Bernanke for further steps to aid the economy, including his support for another economic stimulus package from Washington. "There is light at the end of the tunnel that this credit crisis is coming to an end," said Peter Cardillo, chief market economist at Avalon Partners. "But, until we see the credit markets turn to full normalcy, the stock market is going to be stop and go." On Tuesday, the Fed took more steps to break through a credit clog that has hobbled lending and threatens to plunge the country into a deeper slowdown. The central bank announced it will provide up to $540 billion in financing to help the money market mutual fund industry. The three-month Treasury bill yielded 1.07 percent, down from 1.12 percent late Monday. The levels are a notable improvement from the 0.20 percent seen last Wednesday, when investors were willing to take the slimmest of returns in exchange for a safe place to keep their money. Longer-term Treasurys rose. The yield on the benchmark 10-year note, which moves opposite its price, fell to 3.74 percent from 3.87 percent late Monday. Meanwhile, bank-to-bank lending rates continued their retreat, another indication that credit is becoming easier to obtain. The London Interbank Offered Rate, or Libor, dropped to the lowest levels in more than a month Tuesday. The rate on three-month loans in dollars shed 0.23 percentage points to 3.83 percent, falling for the seventh straight day. Besides being an indicator of the credit market's health, Libor is used to set rates for consumer loans including mortgages and credit cards. In corporate news, Kirk Kerkorian's investment firm said it sold 7.3 million of its shares in Ford Motor Co. and plans further sales. He owns a 6.1 percent stake of the company, whose shares fell 16 cents, or 6.9 percent, to $2.17. Texas Instruments Inc. fell $1.13, or 6.3 percent, to $16.85, hitting $15.85 during the session, its lowest level since March 2003. Meanwhile, Sun Microsystems Inc. dropped $1.01, or 17.5 percent, to $4.77. Among blue chips, DuPont Co. fell $2.89, or 8 percent, to $33.28, while Pfizer Inc. ended unchanged at $17.34 after the drug maker's results narrowly topped projections for the third quarter. Caterpillar Inc. fell $2.07, or 5.1 percent, to $38.83 after reporting that its third-quarter profit fell 6 percent. The world's largest maker of construction and mining equipment said higher raw material costs offset record global sales. The company, which noted "recessionary conditions" in North America, forecast flat sales for 2009. Light, sweet crude fell $3.36 to settle at $70.89 barrel on the New York Mercantile Exchange. 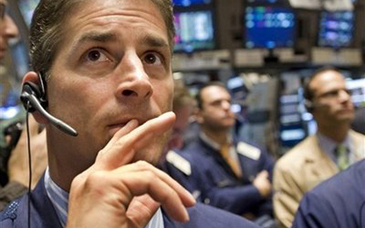 The Russell 2000 index of smaller companies fell 16.19, or 2.96 percent, to 530.65.